Anna (Riesgraf) suffers from agoraphobia and on the the day of her brother's funeral three burglars break into her home. The film sets itself up to follow through on all the home invasion tropes but quickly reveals it has something else in mind. Using a familiar landscape allows the audience to become comfortable and as soon as those expectations are subverted the film comes alive. Its a simple but effective device. There is a moment early on in the film where Anna (wearing her funeral dress) sits down and the pattern of her dress blends perfectly with the couch. It's a moment that speaks volumes about our protagonist. She disappears into the surroundings and it's difficult to tell where she begins and the house ends. Anna has been in this home so long that she has physically become a part of it. It also foreshadows something about her emotional state that I would rather not reveal. It's a small example of the thought that clearly went into the making of this film. Most directors would play up "scares" but its seems like Schindler is more concerned with the emotional ones, and in turn has made something truly special. I'm sure this film will have its detractors, because films like this always do. This is a smart take on familiar material that should be considered for the sum of its parts, not just some of its parts. I honestly can't remember a home invasion film that was this much fun. 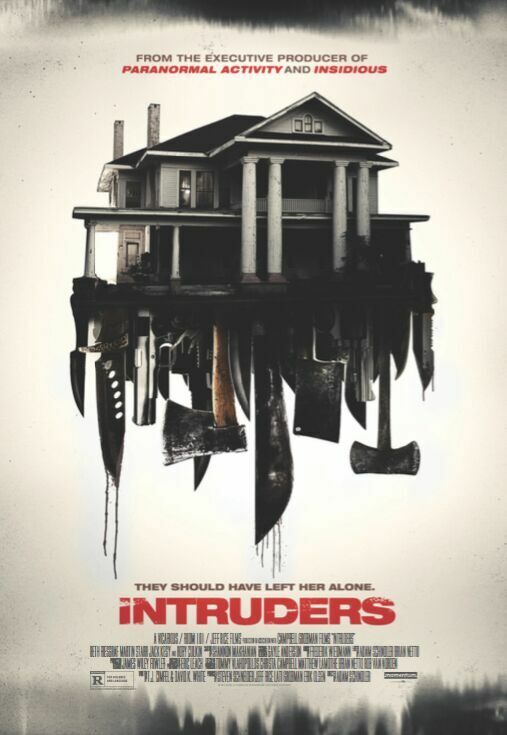 Intruders walks the line between psychological thriller and horror, with some comedy at times and it somehow never feels forced. INTRUDERS opens in cinemas and on VOD Friday, January 15th from Momentum Pictures. Sold-Always an eye peeled for the "smaller gems"-Nice Review!